Anti-type II collagen (anti-CII) Ab is a well-known autoantibody observed in patients with rheumatoid arthritis. Injection of anti-CII Ab and LPS induces arthritis in mice in which anti-CII Ab as well as inflammatory cytokines, IL-1β and TNF-α, play critical roles. We investigated the involvement of IgG FcRs (FcγRs) in this arthritis model. BALB/c mice injected with the F(ab′)2 of anti-CII Ab showed no signs of arthritis. Arthritis development was not observed in FcRγ−/− mice and was partially suppressed in FcγRIII−/− mice despite the binding of anti-CII Ab and C3 to cartilage surface. Surprisingly, BALB/c mice lacking FcγRIIB, which is known as an inhibitory FcγR, developed arthritis with no exacerbation in arthritis score compared with wild-type (WT) mice, and only slight exacerbation was observed in the histopathological analysis. In contrast, aged FcγRIIB−/− BALB/c mice developed arthritis without LPS injection, suggesting an augmented susceptibility to arthritis in aged FcγRIIB−/− mice. No significant difference was observed among BALB/c-WT, -FcRγ−/−, and -FcγRIIB−/− mice on cytokine production induced by anti-CII Ab and LPS injection. Severe arthritis developed in BALB/c-WT and -FcγRIIB−/− mice, but not in BALB/c-FcRγ−/− mice, after the injection of anti-CII Ab and inflammatory cytokines. These results suggest that the reason behind the nondevelopment of arthritis in FcRγ−/− BALB/c mice is not due to a disorder in transient cytokine production, but to an irregularity downstream of cytokine production. Anti-type II collagen (CII)2 Ab is known as an autoantibody in patients with rheumatoid arthritis (1). In mice, immunization with CII induces arthritis (2) only in mice with haplotype H-2q and H-2r (3). In this arthritis model, known as the collagen-induced arthritis model (CIA), anti-CII Ab is regarded as an important factor in the development of arthritis. Terato and others (4, 5) showed that a combination of an anti-CII Ab cocktail (consisting of four IgG mAbs) and LPS injection could induce arthritis in mice with haplotypes other than H-2q and H-2r. The Abs, which were generated using chick CII, recognize conserved epitopes shared by various species, including mouse. In this anti-CII Ab-induced arthritis model, IL-1β and TNF-α as well as anti-CII IgG Ab play crucial roles in arthritis development (6). In mice, three subtypes of IgG receptors (FcγRI, FcγRIIB, and FcγRIII) have been identified (7, 8). FcγRI and FcγRIII are regarded as stimulatory FcγRs, since the receptors transmit stimulatory signals through an immunoreceptor tyrosine-based activation motif (7, 8, 9, 10). These FcγRs are expressed on various cells, including neutrophils, macrophages, and dendritic cells among others. In contrast, FcγRIIB is regarded as an inhibitory receptor and contains an immunoreceptor tyrosine-based inhibition motif (11, 12). FcγRIIB is expressed on cells such as B cells, macrophages, dendritic cells, and mast cells. These FcRs have been shown to play central roles in disease models such as allergy, nephritis, and arthritis (13, 14, 15, 16, 17, 18, 19, 20). Thus, the involvement of FcRs in human diseases has been assumed (9, 20). FcRγ−/− mice were shown to be resistant to the development of Ag-induced arthritis (21), immune complex-mediated arthritis (22), and CIA (19). FcRγ−/− mice, which were regarded to be deficient in functional FcγRI and FcγRIII, were recently shown to express FcγRI to a level ∼20% that in wild-type (WT) mice (23). DBA/1 mice deficient in FcγRIII developed CIA, but to a significantly lesser extent (24). FcγRIIB was inhibitory in the models of glomerulonephritis (25), alveolitis (26), and arthritis (18, 19, 27). Mice lacking FcγRIIB are susceptible to CIA, even those of the haplotype H-2b strain, which is a CIA-resistant strain. Thus, FcγRIIB is also regarded to play a suppressive role in CIA development (18, 19). Complement is believed to be important in the pathogenesis of arthritis. CIA in mice deficient in complement or treated with anti-complement neutralizing Ab was shown to be ameliorated (28, 29, 30). Severe arthritis, however, developed in a small percentage of complement-deficient mice (30). The extent of complement involvement in arthritis development is not yet clear. In the present study we demonstrate the critical involvement of FcRγ and FcγRIII in an anti-CII Ab-induced arthritis model. Although FcγRIIB is regarded as an inhibitory receptor, FcγRIIB−/− mice showed only slight augmentation of arthritis severity in an anti-CII Ab-induced arthritis model of young mice. Aged FcγRIIB mice, however, developed arthritis without LPS injection. Anti-CII Ab and C3 deposition on cartilage surface was observed in every mouse examined, including FcRγ−/− mice. 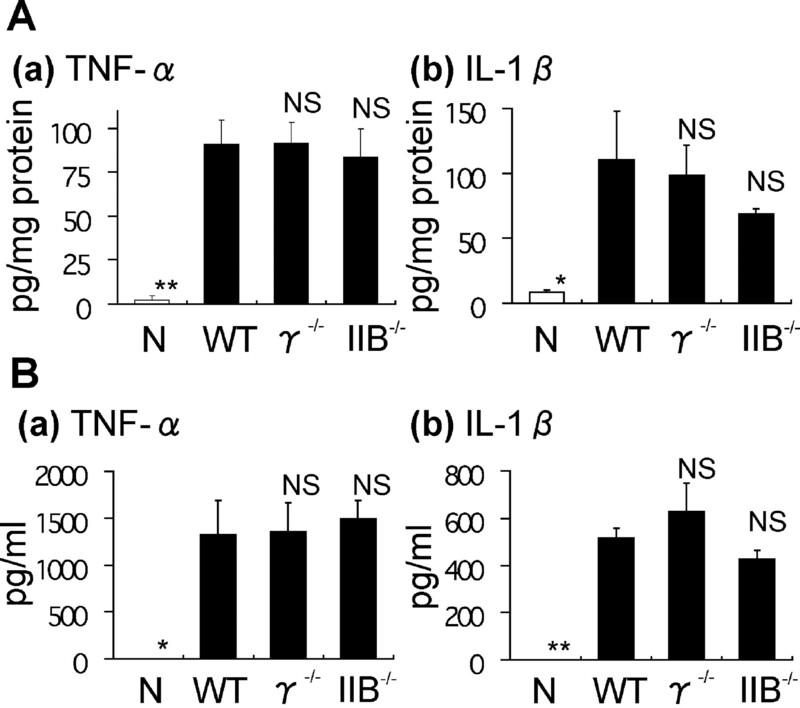 There was no difference in the levels of IL-1β and TNF-α, which are induced by anti-CII Ab and LPS and are important as triggers of arthritis, among WT, FcRγ−/−, and FcγRIIB−/− mice. The responses to IL-1β and TNF-α, however, differed in that FcRγ−/− mice did not develop arthritis. We will discuss below the role and relationship of cytokines and FcRs in arthritis development. Male BALB/cAnNCrj (BALB/c) mice were purchased from Charles River Japan (Tokyo, Japan), and C57BL/6J Jcl (B6) mice were obtained from CLEA Japan (Tokyo, Japan). Male FcRγ−/− (13) and FcγRIIB−/− (14) mice (BALB/c background) were obtained from Taconic Farms (Germantown, NY), and FcγRIII−/− (15) mice (B6 background) were purchased from The Jackson Laboratory (Bar Harbor, ME). All mice were housed at Sankyo Laboratories (Tokyo, Japan) with free access to standard rodent chow diet and water and were used at 5–6 wk of age, except for the experiment using aged (45-wk-old) mice. Arthritis was induced by the method of Terato et al. (4, 5) using an arthritogenic mAb cocktail. The mAb cocktail contains four mAbs (F10, A2, D8, and D1) in equal amounts. Three clones (F10, A2, and D8) are type IgG2a, and one clone (D1) is type IgG2b. For the induction of arthritis, mice were injected i.v. with 2 mg/mouse of anti-CII Ab into the tail vein, and 3 days later 50 μg (BALB/c background) or 100 μg (B6 background) of LPS (Escherichia coli 0111:B4) was i.p. injected. As a control, 2 mg of mouse IgG dissolved in PBS was injected in place of anti-CII Ab. To aged mice, anti-CII Ab was injected at 2 mg/mouse with no LPS injection. To induce arthritis by an injection of recombinant cytokines, anti-CII Ab was i.v. injected to BALB/c mice (2 mg/mouse), and a mixture of rIL-1β and rTNF-α (500 ng + 500 ng/footpad) was s.c. injected into mice 3 days later. The F(ab′)2 of anti-CII Ab was prepared from three clones (F10, A2, and D8) by Immuno-Biological Laboratories using a common pepsin digestion method (31) and was purified by HPLC. The F(ab′)2 or whole IgG of anti-CII Ab (4 mg/mouse) was i.v. injected into mice, and LPS (50 μg/mouse) was i.p. injected 3 days later. In the experiment with F(ab′)2 injection, whole IgG from the same three clones (F10, A2, and D8; equal amounts from each) as the F(ab′)2 was injected into control mice. Mice were carefully examined for any swelling of the hind paws as described previously (6). The severity of arthritis was graded on a 0–3 scale as follows: 0 = normal, 1 = swelling of one digit, 2 = swelling of two or more digits, and 3 = swelling of entire paw. Anti-CII Ab and mouse IgG were labeled with fluorescent dye Alexa Fluor 568 according to the kit protocol with a slight modification. In brief, 50 μl of a 1-M solution of sodium bicarbonate was prepared and added to 500 μl of 2 mg/ml Ab solution. The Ab solution was transferred to a vial containing reactive fluorescent dye and stirred for 1 h at room temperature. After the reaction, fluorescent-labeled Ab was purified using a resin column, which was prewashed with PBS. Fluorescent-labeled Ab was injected into mice at a dose of 1.8 mg/mouse. The mice were sacrificed after 24 h to obtain the hind paws. Fresh-frozen sections were made according to the method of Kawamoto et al. (32). Briefly, the hind paws or knee joints of mice were obtained. These were embedded in 4% carboxymethyl cellulose, and frozen immediately with dry ice-hexane. The frozen carboxymethyl cellulose block was placed on the stage of a cryostat. A plastic film painted with Cryoglue type I (Finetec), which is adhesive even at a low temperature, was stuck to the block, and the block was sectioned with the film. The cryosection adhering to the plastic film was attached to a glass slide using double-sided adhesive tape. The cryosections were air-dried, washed with TBS, and blocked with TBS containing 5% BSA for 20 min at room temperature. Then, FITC-conjugated goat anti-mouse C3 IgG or goat IgG, suspended in TBS containing 1% BSA, was applied to the sections, and these were incubated for 1 h at room temperature. After incubation, the sections were washed twice with TBS containing 1% BSA and once with TBS alone for 5 min each. All sections were mounted with a fluorescent mounting medium, covered with a glass cover, and visualized by a fluorescent microscope system (Vision; Zeiss, Hallbergmoos, Germany). For histopathological analysis, the hind legs were obtained by cutting between knee and ankle. These were then fixed in phosphate-buffered 10% formaldehyde, decalcified with 10% EDTA, and embedded in paraffin using a general method. Sections of hind paws were made by slicing the footpads horizontally, and these were stained with H&E. Evaluation was performed on synovial membranes, bone, and cartilage tissues of the tarsal joint. With regard to synovial membranes, the following events were scored: edema, congestion and/or hemorrhage, infiltration of neutrophils, infiltration of lymphocytes, infiltration of blood plasma cells, infiltration of macrophage cells, proliferation of synovial cells, proliferation of papilla (villi), proliferation of fibroblast, proliferation of granulation tissues, presence of debris in the joint cavity, and increase in blood vessels. On bone and cartilage tissues, degeneration and/or death of chondrocytes, destruction of cartilage tissues, infiltration of neutrophils, destruction of bone tissues, increase in osteoclast, and ostitis and/or periostitis were scored. The severity was graded as follows: 0 = normal, 1 = slight change, 2 = mild change, and 3 = severe change. The score was summed for the synovial membrane and for bone and cartilage, and results are shown as the mean ± SEM. Neutralizing Abs to IL-1β and TNF-α were i.v. injected together into mice each at a dose of 500 μg/mouse. The Abs were injected at different time points: 1 day before anti-CII injection, 1 day before LPS injection, and 1 day after LPS injection. As a control, isotype-matched rat IgG1 Ab (1 mg/mouse) was injected into mice given anti-CII Ab and LPS. Hind footpads were obtained from mice by cutting at the borderline of fur growth. The footpads were homogenized in ice-cold homogenization buffer (PBS supplemented with 1% protease inhibitor cocktail, 10 mM EDTA, and 100 μM indomethacin) using a Polytron homogenizer (KINEMATICA, Lucerne, Switzerland). The volume of homogenization buffer was adjusted to 150 mg of tissue/ml buffer. The homogenate was centrifuged for 15 min at 1870 × g, and the supernatants were centrifuged for 5 min at 13,230 × g. The supernatants were subjected to ELISA analysis to measure IL-1β and TNF-α concentrations according to the protocol of each ELISA kit. The concentration of total protein in the supernatants was measured using a protein assay dye reagent and was normalized against the concentration of BSA. The concentration of cytokines was expressed as picograms per milligram of protein. Venous blood was obtained from anesthetized mice with a heparinized syringe and was centrifuged for 5 min at 13,230 × g to obtain plasma. The concentrations of IL-1β and TNF-α in mouse plasma were measured by ELISA. Statistical significance was determined by parametric Dunnett’s test in the comparison of cytokine concentrations and by nonparametric Dunnett’s test in the comparison of arthritis scores and histopathological results. Anti-CII Ab injection followed by LPS injection induces arthritis in mice. To demonstrate the involvement of FcRs in arthritis induction, the F(ab′)2 of anti-CII Ab was injected into mice, and LPS was subsequently injected. The arthritis score of the mice injected with anti-CII whole IgG increased daily after LPS injection and reached a maximum of 5.2 ± 0.5 (mean ± SEM) between days 6 and 7 (Fig. 1⇓A). The arthritis score remained the same for the next 3–5 days and gradually decreased (data not shown). In contrast, anti-CII F(ab′)2 Ab-injected mice did not show any sign of arthritis (arthritis score, 0) throughout the period of scoring. Injection of whole or F(ab′)2 of anti-CII Ab. A, Time course of arthritis development. Whole anti-CII Ab (•) or its F(ab′)2 (▴) was injected into BALB/c mice on day 0, followed by LPS injection 3 days later. The severity of arthritis was judged and scored as described in Materials and Methods, and the sum of the scores of both hind paws was recorded. The data were expressed as the mean ± SEM of five mice in each group. The value was significantly different from that of the whole-IgG-injected group (∗, p < 0.05; ∗∗, p < 0.01). B, Fluorescent-labeled Ab deposition is shown. Mouse IgG (mIgG; a), whole anti-CII Ab (whole; b), and F(ab′)2 anti-CII Ab (F(ab′)2; c) were labeled with fluorescent dye (red) and injected into mice. Hind paws were obtained 24 h after the injection, and cryostat sections of the tarsal joints were prepared. Brightfield images (left panels) of the joints and the corresponding fluorescent images (right panels) were observed by fluorescent microscopy. Original magnification, ×100. To confirm localization of anti-CII Ab in joints, whole IgG or F(ab′)2 of anti-CII Ab was labeled with the fluorescent dye Alexa Fluor 568 and i.v. injected into mice. Hind paws were obtained 24 h after the injection, and cryostat sections were made. By fluorescent microscopy, fluorescent-labeled anti-CII Ab (whole IgG) was found to bind to the cartilage surface of tarsal joints (Fig. 1⇑Bb). Fluorescent-labeled anti-CII F(ab′)2 also bound to the surface of articular cartilage (Fig. 1⇑Bc). Binding of both whole and F(ab′)2 of anti-CII Ab was also observed on the cartilage surfaces of interphalangeal and knee joints (data not shown). Binding to the cartilage surface was not observed in mice injected with fluorescent-labeled mouse IgG (Fig. 1⇑Ba). Taken together, arthritis was not induced in anti-CII F(ab′)2-injected mice despite the binding of F(ab′)2 to the cartilage surface as seen with anti-CII whole IgG. To verify the involvement of FcγRs in arthritis development, FcRγ−/− mice, which lack functional FcγRI and -III, were injected with anti-CII Ab and LPS. In WT mice, paw edema appeared gradually after LPS injection, and the swelling reached a peak between days 6 and 7 (Fig. 2⇓A). Arthritis did not develop in FcRγ−/− mice throughout the scoring period. In contrast, arthritis developed in FcγRIIB−/− mice and was as severe as that in WT mice, judging from the arthritis score. There was no significant difference between WT and FcγRIIB−/− mice in arthritis score. As shown in Fig. 2⇓B, infiltration of neutrophils and macrophages, presence of debris in cavity, and cartilage destruction were observed in WT and FcγRIIB−/− mice. Based on the histopathological scoring (Table I⇓), the severity of joint destruction in FcγRIIB−/− mice (synovial membrane, 10.5 ± 0.6; bone and cartilage, 6.5 ± 0.9 (mean ± SEM)) was a little more severe than that in WT (synovial membrane, 7.0 ± 0.9; bone and cartilage, 5.3 ± 0.9), but the difference was slight and not significant. Consistent with the arthritis score, histopathological analysis showed no destruction of joints; there was no cell infiltration and no cartilage destruction in FcRγ−/− mice, as was the case in untreated normal mice. Arthritis development in WT and FcγRIIB−/− mice, but not in FcRγ−/− mice. A, Time course of arthritis development in BALB/c-WT (•), -FcRγ−/− (▴), and -FcγRIIB−/− (▪) mice is shown. Arthritis was induced in mice by the injection of anti-CII Ab on day 0, followed by LPS injection on day 3. The arthritis score is expressed as the mean ± SEM of eight mice in each group. The value was significantly different from that in the WT group (∗, p < 0.05; ∗∗, p < 0.01). NS, not significant throughout the period of scoring. B, Joint histopathology results of arthritis-induced WT, untreated normal WT (Norm), FcRγ−/− (γ−/−), and FcγRIIB−/− (IIB−/−) mice are shown. Mouse hind paws were obtained 14 days after arthritis induction. Tarsal joint sections were made after fixation and decalcification and were stained with H&E. Original magnification, ×100. As arthritis did not develop in FcRγ−/− mice, FcγRI and/or FcγRIII could be considered to play a critical role in arthritis development. To evaluate the importance of each receptor, FcγRIII−/− mice were injected with anti-CII Ab and LPS to induce arthritis. As shown in Fig. 3⇓, arthritis also developed in FcγRIII−/− mice (incidence, 100%; arthritis score, 2.1 ± 0.4 (mean ± SEM)). However, partial, but significant (p < 0.05), amelioration of arthritis severity was observed in comparison with that of WT mice (incidence, 100%; arthritis score, 4.8 ± 0.7). Ameliorated arthritis development in FcγRIII−/− mice. The time course of arthritis development is shown. Anti-CII Ab was injected into B6-WT (○) and FcγRIII−/− (▵) mice on day 0, and the arthritis score was recorded daily after LPS injection on day 3. The data were expressed as the mean ± SEM of five mice in each group. ∗, The value was significantly different from the WT group (p < 0.05). FcγRIIB is regarded as an inhibitory receptor. However, 5- to 6-wk-old FcγRIIB−/− mice exhibited only a slight augmentation of arthritis development in the anti-CII Ab-induced arthritis model as stated above. To explore the involvement of FcγRIIB at different ages, aged (45-wk-old) WT, FcRγ−/−, and FcγRIIB−/− BALB/c mice were injected with anti-CII Ab to induce arthritis. In general, LPS was injected into mice 3 days after anti-CII Ab injection for arthritis induction. Some aged FcγRIIB−/− mice, however, had developed severe arthritis without LPS injection (Fig. 4⇓). 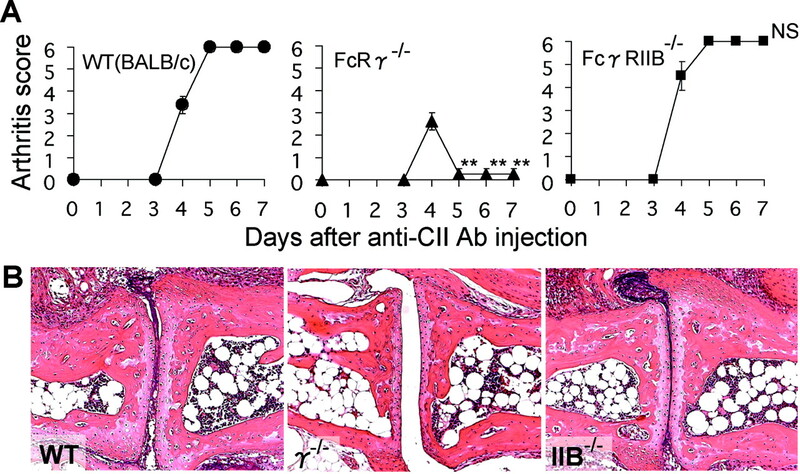 Three of five FcγRIIB−/− mice developed arthritis by day 2, and swelling was still observed 7 days after anti-CII Ab injection. In contrast, anti-CII Ab injection without LPS in age-matched WT or FcRγ−/− mice did not induce arthritis. These data suggest that aged FcγRIIB−/− mice are highly susceptible to anti-CII Ab-induced arthritis compared with WT mice and that aging could affect the susceptibility to arthritis. High susceptibility to anti-CII Ab-induced arthritis in aged FcγRIIB−/− mice. BALB/c-WT, -FcRγ−/−, and -FcγRIIB−/− mice, 45 wk of age, were injected with anti-CII Ab on day 0 as described in Materials and Methods. The individual arthritis scores of five mice are shown. Arthritis did not develop in FcRγ−/− mice; thus, it was confirmed that anti-CII Ab reached the joints. Anti-CII Ab was labeled with the fluorescent dye Alexa Fluor 568 and i.v. injected into WT, FcRγ−/−, FcγRIIB−/−, and FcγRIII−/− mice. Fresh-frozen sections of the tarsal joints were made and observed by fluorescent microscopy. As shown in Fig. 5⇓B, a fluorescent signal indicating the existence of anti-CII Ab was observed in all mice, including WT, FcRγ−/−, FcγRIIB−/−, and FcγRIII−/− mice, in every joint examined (tarsal and interphalangeal joints). The fluorescent signal was specifically observed on the cartilage surfaces. Anti-CII Ab and C3 deposition on cartilage surface. 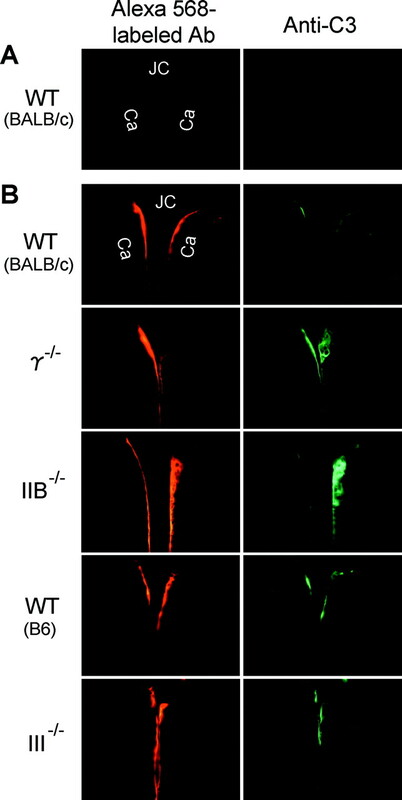 Mouse IgG (A) or anti-CII Ab (B) were labeled with fluorescent dye Alexa Fluor 568 (red) and injected into the following mice: WT (BALB/c), FcRγ−/− (γ−/−), FcγRIIB−/− (IIB−/−), WT (B6), and FcγRIII−/− (III−/−). Mice were sacrificed 24 h after the injection, and hind paws were obtained to prepare cryostat sections. The sections of tarsal joints were stained with anti-C3 Ab (green) and observed by fluorescent microscopy. The depositions of fluorescent-labeled anti-CII Ab (B, left panels) were observed on the cartilage surface (Ca) in the joint cavities (JC) in every mouse, except in the IgG-injected group (A, left panel). Original magnification, ×200. Since anti-CII Ab bound to the cartilage surface, it could form an immune complex with CII on the cartilage surface. Immune complexes are known to induce complement activation. Therefore, the deposition of C3 was investigated by immunohistochemistry using FITC-labeled anti-C3 Ab. C3 bound to the cartilage surface of WT mice in a colocalized manner with anti-CII Ab (Fig. 5⇑B). C3 also bound to the cartilage surface of FcRγ−/− and FcγRIII−/− mice as well as that of FcγRIIB−/− mice. The joints of the mice that were i.v. injected with Alexa Fluor 568-labeled mouse IgG showed no fluorescent signal on the cartilage surface, nor was C3 deposition observed (Fig. 5⇑A). These results suggest that the binding of anti-CII Ab to the cartilage surface and subsequent C3 deposition are not enough to induce arthritis. The levels of inflammatory cytokines such as IL-1β and TNF-α were elevated after arthritis induction, transiently on day 3 and consistently after day 4 (6). The cytokines play important roles in arthritis development, as shown by the fact that neutralizing Abs to cytokines prevent arthritis development. However, the phase important for the prevention of arthritis development was not clear. We injected neutralizing Abs to IL-1β and TNF-α at different time points and evaluated the phase important for arthritis development. As shown in Fig. 6⇓, injection of neutralizing Abs on day −1 (1 day before anti-CII Ab injection) effectively inhibited arthritis development, and injection on day 2 (1 day before LPS injection) was also effective. When injected on day 4 (1 day after LPS injection), however, although arthritis developed, the arthritis score diminished gradually, and it decreased significantly on day 7. These data suggest that both transient cytokine elevation on day 3 after LPS injection and gradual cytokine elevation are important in arthritis development, although it is necessary to inhibit transient cytokines on day 3 for an almost complete inhibition of arthritis development. Neutralization of cytokines at different time points of arthritis development. 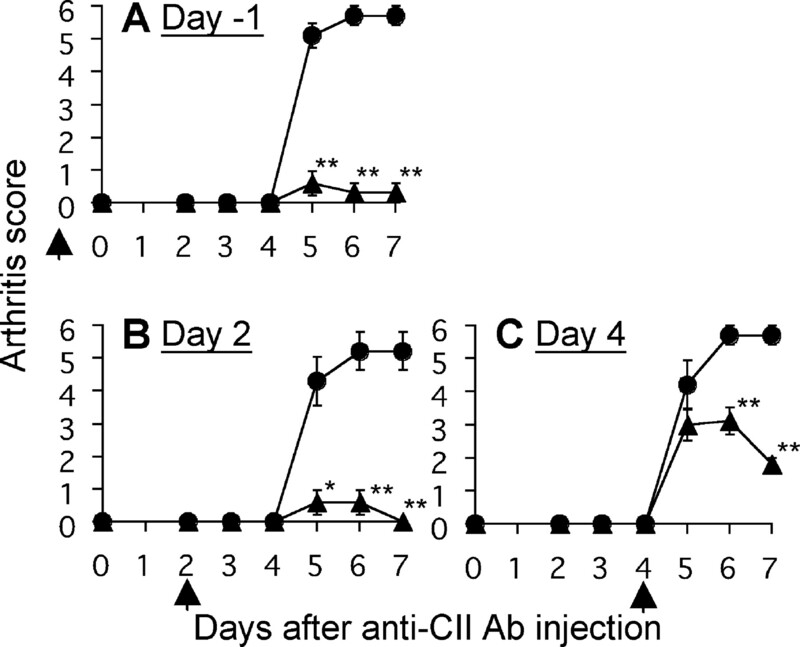 Anti-CII Ab and LPS were injected into BALB/c mice on days 0 and 3, respectively, and anti-IL-1β and anti-TNF-α Abs (▴) or isotype-matched rat IgG1 Ab (•) was injected into mice 1 day before anti-CII Ab injection (A) and 1 day before (B) or after (C) LPS injection as described in Materials and Methods. Arrows show the injection times of neutralizing Ab and rat IgG1 Ab. The mean arthritis score ± SEM of five mice are shown (∗, p < 0.05; ∗∗, p < 0.01 (vs control Ab-injected group)). We investigated the cytokine (IL-1β and TNF-α) level in the hind footpad and plasma of WT, FcRγ−/−, and FcγRIIB−/− mice after anti-CII Ab and LPS injection. TNF-α and IL-1β reached a peak level at 2 and 4 h, respectively, after LPS injection (6). Thus, the cytokine level at 2 h (TNF-α) and 4 h (IL-1β) after LPS injection was measured. As for the level in the footpad, elevation of TNF-α and IL-1β was observed in LPS-injected WT, FcγRIIB−/−, and FcRγ−/− mice (Fig. 7⇓A). No significant difference was observed among the groups. Consistent with results in the footpad, plasma levels of TNF-α and IL-1β were also elevated in all LPS-injected groups, including FcRγ−/− mice, and there were no significant differences among the groups (Fig. 7⇓B). There was no difference in cytokine production in WT, FcRγ−/−, and FcγRIIB−/− mice. Anti-CII Ab was injected into BALB/c-WT, -FcRγ−/−, and -FcγRIIB−/− mice on day 0, and LPS was injected 3 days later. The hind footpad and plasma of WT, FcRγ−/− (γ−/−), and FcγRIIB−/− (IIB−/−) mice were obtained 2 and 4 h, respectively, after LPS injection. The footpad and plasma of untreated normal (N) mice were also obtained. The levels of TNF-α (a) and IL-1β (b) in footpads (A) and plasma (B) were measured as described in Materials and Methods. The data are expressed as the mean ± SEM of three mice in each group. The values were significantly different from those in the WT group (∗, p < 0.05; ∗∗, p < 0.01). A previous study showed that anti-CII Ab injection followed by s.c. cytokine injection induced severe arthritis in WT mice (6). To evaluate the reactivity of FcRγ−/− mice and FcγRIIB−/− mice to inflammatory cytokines, we s.c. injected recombinant cytokines (rIL-1β and rTNF-α) into the mouse footpad 3 days after i.v. injection of anti-CII Ab. By the injection of anti-CII Ab and cytokines, very severe arthritis was induced in FcγRIIB−/− mice as well as in WT mice at an incidence of 100% (Fig. 8⇓A). In contrast, only transient and slight swelling was observed in FcRγ−/− mice on day 4, and the swelling disappeared on day 5. By histopathological analysis, infiltration of neutrophils and macrophages, deposition of debris, and cartilage destruction were observed in WT and FcγRIIB−/− mice. However, FcRγ−/− mice showed little infiltration of cells, and only a slight change in cartilage surface was observed (Fig. 8⇓B). Transient swelling was also observed in mice injected with cytokines only (data not shown). Thus, the transient swelling observed in FcRγ−/− mice was due to a direct effect of cytokines. These results suggest that FcRγ−/− mice did not develop arthritis because of an irregularity downstream of cytokine production compared with WT, not due to low cytokine production. Arthritis development by cytokine injection in WT and FcγRIIB−/− mice, but not in FcRγ−/− mice. A, BALB/c-WT (•), -FcRγ−/− (▴), and -FcγRIIB−/− (▪) mice were injected with anti-CII Ab on day 0. A mixture of rIL-1β (500 ng) and rTNF-α (500 ng) was injected s.c. into the mouse footpad 3 days after anti-CII Ab injection, and the arthritis score was recorded daily after cytokine injection. The arthritis scores are shown as the mean ± SEM of four mice in each group. The values were significantly different from those in the WT group (∗∗, p < 0.01). NS, not significant throughout the period of scoring. B, H&E-stained joint sections of arthritis-induced WT (WT), FcRγ−/− (γ−/−), and FcγRIIB−/− (IIB−/−) mice on day 7. Original magnification, ×100. We have used the anti-CII Ab-induced arthritis model to elucidate the roles of FcγRs in arthritis development. Injecting the F(ab′)2 of anti-CII Ab did not induce arthritis, and no sign of arthritis development was observed in FcRγ−/− mice. Mice deficient in FcγRIIB, known as an inhibitory receptor, developed arthritis, although a large difference in the arthritis score was not observed compared with that in WT mice. 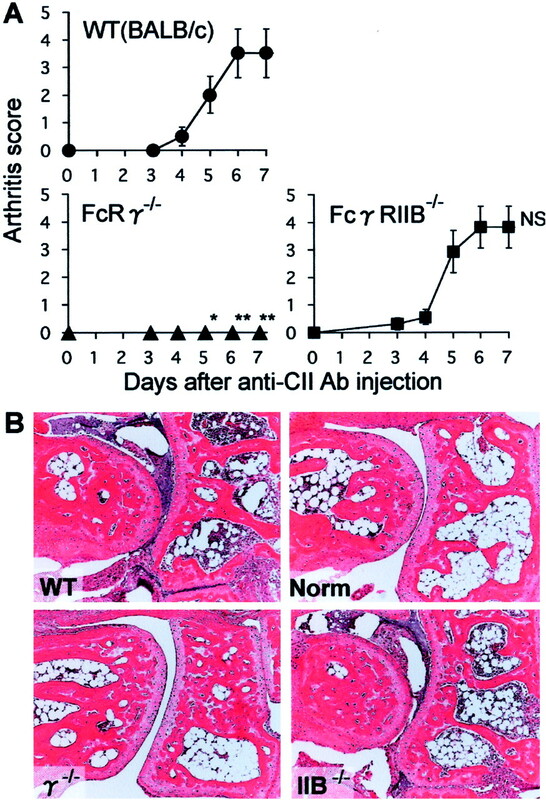 Surprisingly, aged FcγRIIB−/− mice showed high susceptibility to anti-CII Ab-induced arthritis. In FcγRIII−/− mice, an amelioration in the arthritis score was observed. Anti-CII Ab and C3 deposition was observed in all mice, including FcRγ−/− and FcγRIII−/− mice. The cytokine level induced by anti-CII Ab and LPS injection did not differ among WT, FcRγ−/−, and FcγRIIB−/− mice. However, the outcome after cytokine production was different in FcRγ−/− mice. FcγRs have been shown to play crucial roles in arthritis development. Arthritis development was inhibited in FcRγ−/− mice in the CIA model (19), and a similar effect was reported in the Ag-induced arthritis model (21). Arthritis also did not develop in our study using the anti-CII Ab-induced arthritis model, which skips the induction phase of CIA, in which T cell activation and Ab production by B cells occur. Immunization of FcRγ−/− mice with CII was reported to yield a high level of anti-CII Ab, although arthritis did not develop (8, 19). If anti-CII Ab-induced arthritis can be considered to represent the effector phase of CIA, FcRγ would play a crucial role in the effector phase. FcγRI and FcγRIII are reported to play crucial roles in Ag-induced arthritis (21, 27, 33), and the involvement of FcγRI is reported to be greater than that of FcγRIII in the model (27). In contrast, a critical contribution of FcγRIII in CIA (24) and a contribution of FcγRIII and noninvolvement of FcγRI in the arthritis model prepared by K/B×N serum transfer (34) were reported. In our study arthritis severity in FcγRIII−/− mice was reduced by almost 56% in terms of arthritis score compared with WT mice. Recently, FcRγ−/− mice were reported to express FcγRI to a level ∼20% that in WT mice (23), but arthritis did not develop in FcRγ−/− mice in our study. The degree of involvement of FcγRI and FcγRIII in anti-CII Ab-induced arthritis is difficult to estimate, but what could be said is that the signaling through FcγRIII is associated with arthritis development in this model. The role of FcγRIIB as an inhibitory receptor has been shown in many experimental models: anaphylactic responses, hypersensitivity responses, immune complex-mediated alveolitis, Ab-induced glomerulonephritis, and Ag-induced arthritis (14, 25, 26, 27). What is more, CIA develops even in CIA-resistant mice of the H-2b haplotype when FcγRIIB is unexpressed (18). However, Ji et al. (35) showed the noninvolvement of FcγRIIB in a serum transfer arthritis model in B6 × 129 background mice. No augmentation of arthritis score and only a slight augmentation of the histopathological score were observed in our study using young FcγRIIB−/− mice. This discrepancy could be due to the following reasons. One possibility is that the inhibitory activity via FcγRIIB appears in an age- and/or strain-dependent manner. In our study aged FcγRIIB−/− mice were more susceptible to anti-CII Ab-induced arthritis in our study, although there were some aged mice that did not develop arthritis. The reason for this has not yet been determined. Spontaneous development of glomerulonephritis in FcγRIIB−/− mice was only observed in a particular strain (17). Another possibility is the slight or noninvolvement of the cells expressing FcγRIIB, which also transmit an inhibitory signal, in the development of Ab-induced arthritis. B cell contribution is refuted in the anti-CII Ab-induced arthritis model (6), because this Ab-induced arthritis model skips the induction phase of CIA. Thus, if the inhibitory signal via FcγRIIB was mainly by B cells, it would be natural to see no augmentation of the arthritis score in young FcγRIIB−/− mice, as observed in our study. However, infiltration of macrophages and polymorphonuclear leukocytes was observed in anti-CII Ab-induced arthritic joints, and FcγRIIB was reported to be expressed on these cells. There is also the possibility that noninfiltrating cells existing in the surrounding area of the joint could contribute to arthritis development. Complement is also regarded as an important factor in arthritis development (28, 29, 30), although IgG-mediated inflammation could occur without complement (36). C3- and C5-deficient mice showed improved arthritis symptoms in the CIA model (28, 30). Although the anti-CII Ab level and arthritis severity were reduced in C5-deficient mice, C3 was shown to be deposited on the cartilage surface of C5-deficient mice as in WT mice (30). The binding of C3 to cartilage was shown not to be pathogenic in an arthritis model of mice deficient in C4 and CR1 and -2 (37). Furthermore, it was reported that a small percentage of complement-deficient mice developed arthritis (30). In our study, the deposition of C3 colocalized with anti-CII Ab was observed even in nonarthritic FcRγ−/− mice as well as in WT, FcγRIIB−/−, and FcγRIII−/− mice. These results suggest that C3 may not necessarily be required to induce arthritis, and C3 deposition induced by anti-CII Ab binding to the cartilage surface may not be enough to induce the subsequent onset of arthritis. IL-1β and TNF-α are important cytokines in Ab-induced arthritis development. The cytokine level that was elevated transiently after LPS injection fell to basal levels and increased gradually thereafter with arthritis development (6). IL-1β and TNF-α were transiently elevated as well in FcRγ−/− mice, which did not develop arthritis. The levels of IL-1β and TNF-α were elevated within a few hours after LPS injection and fell shortly thereafter. Neutralizing these transient cytokines was shown to inhibit arthritis development. Thus, the transient increase in cytokines could be considered a crucial trigger of arthritis induction. Injection of these cytokines into FcRγ−/− mice did not result in the induction of arthritis even if anti-CII Ab was injected beforehand. These results indicate that transient elevation of cytokine is important in arthritis development. However, the level of transient cytokine is not affected by the presence or the absence of FcRγ and FcγRIIB. FcγRs seem to play a crucial role after transient cytokine elevation; it is not clear what happens after this. Inflammatory cytokines were shown to induce many events, including elevation of vascular vessel permeability and induction of proteases and chemoattractants (38, 39). The expression levels of various proteases, including matrix metalloproteinases, were increased after transient cytokine elevation in the mouse footpad (our unpublished observations). Thus, soluble and/or insoluble CII could be considered to have increased in the joint area by the degradation of cartilage matrix. Considering that anti-CII Ab was already bound on the cartilage surface, soluble and/or insoluble immune complexes of CII and anti-CII Ab may have been formed outside of the cartilage surface and induced FcγR-mediated cell signaling. The cells that infiltrated into the joints were mainly Gr-1-positive polymorphonuclear leukocytes and F4/80-positive macrophages, and they were also FcγRIIB/III-positive (our unpublished observations). In this case, the signaling through these cells may have induced subsequent cytokine production and joint destruction. We are grateful to Dr. Kensuke Miyake for his helpful discussions, and to Drs. Azusa Seki, Keiko Izumi, and Masanobu Mitani for their technical support regarding the histopathological and immunohistochemical analyses. We also acknowledge Emelyne Uchiyama for proofreading this manuscript. ↵2 Abbreviations used in this paper used in this paper: CII, type II collagen; CIA, collagen-induced arthritis. Andriopoulos, N. A., J. Mestecky, E. J. Miller, E. L. Bradley. 1976. Antibodies to native and denatured collagens in sera of patients with rheumatoid arthritis. Arthritis Rheum. 19:613. Courtenay, J. S., M. J. Dallman, A. D. Dayan, A. Martin, B. Mosedale. 1980. Immunisation against heterologous type II collagen induces arthritis in mice. Nature 283:666. Wooley, P. H., H. S. Luthra, M. M. Griffiths, J. M. Stuart, A. Huse, C. S. David. 1985. Type II collagen-induced arthritis in mice. IV. Variations in immunogenetic regulation provide evidence for multiple arthritogenic epitopes on the collagen molecule. J. Immunol. 135:2443. Terato, K., K. A. Hasty, R. A. Reife, M. A. Cremer, A. H. Kang, J. M. Stuart. 1992. Induction of arthritis with monoclonal antibodies to collagen. J. Immunol. 148:2103. Terato, K., D. S. Harper, M. M. Griffiths, D. L. Hasty, X. J. Ye, M. A. Cremer, J. M. Seyer. 1995. Collagen-induced arthritis in mice: synergistic effect of E. coli lipopolysaccharide bypasses epitope specificity in the induction of arthritis with monoclonal antibodies to type II collagen. Autoimmunity 22:137. Kagari, T., H. Doi, T. Shimozato. 2002. The importance of IL-1β and TNF-α, and the noninvolvement of IL-6, in the development of monoclonal antibody-induced arthritis. J. Immunol. 169:1459. Ravetch, J. V., S. Bolland. 2001. IgG Fc receptors. Annu. Rev. Immunol. 19:275. Nakamura, A., M. Ono, T. Nukiwa, T. Takai. 2000. Role of Fc receptor in murine model of the autoimmune disease. Saishin Igaku 55:2310. Salmon, J. E., L. Pricop. 2001. Human receptors for immunoglobulin G. Arthritis Rheum. 44:739. Billadeau, D. D., P. J. Leibson. 2002. ITAMs versus ITIMs: striking a balance during cell regulation. J. Clin. Invest. 109:161. Muta, T, T. Kurosaki, Z. Misulovin, M. Sanchez, M. C. Nussenzweig, J. V. Ravetch. 1994. A 13-amino-acid motif in the cytoplasmic domain of Fc gamma RIIB modulates B-cell receptor signalling. Nature 368:70. Ono, M, S. Bolland, P. Tempst, J. V. Ravetch. 1996. Role of the inositol phosphatase SHIP in negative regulation of the immune system by the receptor Fc(γ)RIIB. Nature 383:263. Takai, T., M. Li, D. Sylvestre, R. Clynes, J. V. Ravetch. 1994. FcRγ chain deletion results in pleiotrophic effector cell defects. Cell. 76:519. Takai, T., M. Ono, M. Hikida, H. Ohmori, J. V. Ravetch. 1996. Augmented humoral and anaphylactic responses in FcγRII-deficient mice. Nature 379:346. Hazenbos, W. L., J. E. Gessner, F. M. Hofhuis, H. Kuipers, D. Meyer, I. A. Heijnen, R. E. Schmidt, M. Sandor, P. J. Capel, M. Daeron, et al 1996. Impaired IgG-dependent anaphylaxis and Arthus reaction in FcγRIII (CD16) deficient mice. Immunity 5:181. Clynes, R., C. Dumitru, J. V. Ravetch. 1998. Uncoupling of immune complex formation and kidney damage in autoimmune glomerulonephritis. Science 279:1052. Bolland, S., J. V. Ravetch. 2000. Spontaneous autoimmune disease in Fc(γ)RIIB-deficient mice results from strain-specific epistasis. Immunity 13:277. Yuasa, T., S. Kubo, T. Yoshino, A. Ujike, K. Matsumura, M. Ono, J. V. Ravetch, T. Takai. 1999. Deletion of Fcγ receptor IIB renders H-2(b) mice susceptible to collagen-induced arthritis. J. Exp. Med. 189:187. Kleinau, S., P. Martinsson, B. Heyman. 2000. Induction and suppression of collagen-induced arthritis is dependent on distinct Fcγ receptors. J. Exp. Med. 191:1611. Nieto, A., R. Caliz, M. Pascual, L. Mataran, S. Garcia, J. Martin. 2000. Involvement of Fcγ receptor IIIA genotypes in susceptibility to rheumatoid arthritis. Arthritis Rheum. 43:735.
van Lent, P. L., A. J. van Vuuren, A. B. Blom, A. E. Holthuysen, L. B. van de Putte, J. G. van de Winkel, W. B. van den Berg. 2000. Role of Fc receptor γ chain in inflammation and cartilage damage during experimental antigen-induced arthritis. Arthritis Rheum. 43:740. Blom, A. B., P. L. van Lent, H. van Vuuren, A. E. Holthuysen, C. Jacobs, L. B. van de Putte, J. G. van de Winkel, W. B. van den Berg. 2000. Fc gamma R expression on macrophages is related to severity and chronicity of synovial inflammation and cartilage destruction during experimental immune-complex-mediated arthritis (ICA). Arthritis Res. 2:489. Barnes, N., A. L. Gavin, P. S. Tan, P. Mottram, F. Koentgen, P. M. Hogarth. 2002. FcγRI-deficient mice show multiple alterations to inflammatory and immune responses. Immunity 16:379. Diaz de Stahl, T., M. Andren, P. Martinsson, J. S. Verbeek, S. Kleinau. 2002. Expression of FcγRIII is required for development of collagen-induced arthritis. Eur. J. Immunol. 32:2915. Suzuki, Y., I. Shirato, K. Okumura, J. V. Ravetch, T. Takai, Y. Tomino, C. Ra. 1998. Distinct contribution of Fc receptors and angiotensin II-dependent pathways in anti-GBM glomerulonephritis. Kidney Int. 54:1166. Clynes, R., J. S. Maizes, R. Guinamard, M. Ono, T. Takai, J. V. Ravetch. 1999. Modulation of immune complex-induced inflammation in vivo by the coordinate expression of activation and inhibitory Fc receptors. J. Exp. Med. 189:179.
van Lent, P. L., K. Nabbe, A. B. Blom, A. E. Holthuysen, A. Sloetjes, L. B. van de Putte, S. Verbeek, W. B. van den Berg. 2001. Role of activatory FcγRI and FcγRIII and inhibitory FcγRII in inflammation and cartilage destruction during experimental antigen-induced arthritis. Am. J. Pathol. 159:2309. Hietala, M. A., I. M. Jonsson, A. Tarkowski, S. Kleinau, M. Pekna. 2002. Complement deficiency ameliorates collagen-induced arthritis in mice. J. Immunol. 169:454. Wang, Y., S. A. Rollins, J. A. Madri, Matis L. A.. 1995. Anti-C5 monoclonal antibody therapy prevents collagen-induced arthritis and ameliorates established disease. Proc. Natl. Acad. Sci. USA 92:8955. Wang, Y., J. Kristan, L. Hao, C. S. Lenkoski, Y. Shen, L. A. Matis. 2000. A role for complement in antibody-mediated inflammation: C5-deficient DBA/1 mice are resistant to collagen-induced arthritis. J. Immunol. 164:4340. Lamoyi, E., A. Nisonoff. 1983. Preparation of F(ab′)2 fragments from mouse IgG of various subclasses. J. Immunol. Methods 56:235. Kawamoto, T., M. Shimizu. 2000. A method for preparing 2- to 50-micron-thick fresh-frozen sections of large samples and undecalcified hard tissues. Histochem. Cell Biol. 113:331. Ioan-Facsinay, A., S. J. de Kimpe, S. M. Hellwig, P. L. van Lent, F. M. Hofhuis, H. H. van Ojik, C. Sedlik, S. A. da Silveira, J. Gerber, Y. F. de Jong, et al 2002. FcγRI (CD64) contributes substantially to severity of arthritis, hypersensitivity responses, and protection from bacterial infection. Immunity 16:391. Ji, H., K. Ohmura, U. Mahmood, D. M. Lee, F. M. Hofhuis, S. A. Boackle, K Takahashi, V. M. Holers, M. Walport, C. Gerard, et al 2002. Arthritis critically dependent on innate immune system players. Immunity 16:157. Ji, H., D. Gauguier, K. Ohmura, A. Gonzalez, V. Duchatelle, P. Danoy, H. J. Garchon, C. Degott, M. Lathrop, C. Benoist, et al 2001. Genetic influences on the end-stage effector phase of arthritis. J. Exp. Med. 194:321. Sylvestre, D., R. Clynes, M. Ma, H. Warren, M. C. Carroll, J. V. Ravetch. 1996. Immunoglobulin G-mediated inflammatory responses develop normally in complement-deficient mice. J. Exp. Med. 184:2385. Solomon, S., C. Kolb, S. Mohanty, E. Jeisy-Walder, R. Preyer, V. Schollhorn, H. Illges. 2002. Transmission of antibody-induced arthritis is independent of complement component 4 (C4) and the complement receptors 1 and 2 (CD21/35). Eur. J. Immunol. 32:644. Choy, E. H., G. S. Panayi. 2001. Cytokine pathways and joint inflammation in rheumatoid arthritis. N. Engl. J. Med. 344:907.